The natural range of Magnolia species is rather scattered and includes eastern North America, Central America and the West Indies and east and southeast Asia. Some species are found in South America. Today many species of Magnolia and an ever increasing number of hybrids can also be found as ornamentals in large parts of North America, Europe, Australia and New Zealand. The genus is named after French botanist Pierre Magnol, from Montpellier. Magnolia is an ancient genus. Having evolved before bees appeared, the flowers developed to encourage pollination by beetles. As a result, the carpels of Magnolia flowers are tough, to avoid damage by eating and crawling beetles. Fossilised specimens of M. acuminata have been found dating to 20 million years ago, and of plants identifiably belonging to the Magnoliaceae dating back to 95 million years ago. Another primitive aspect of Magnolias is their lack of distinct sepals or petals. The term tepal has been coined to refer to the intermediate element that Magnolia has instead. Magnolias are used as food plants by the larvae of some Lepidoptera species including Giant Leopard Moth. 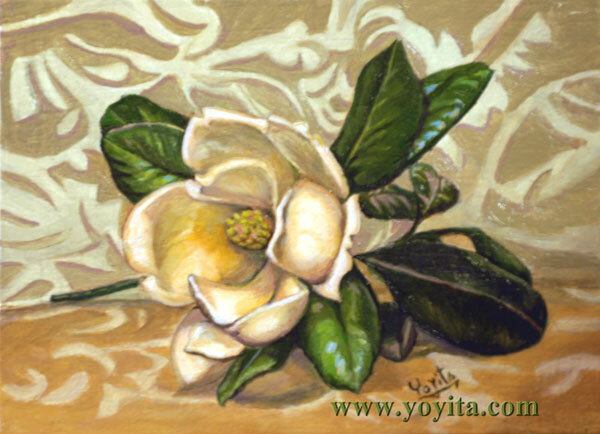 Magnolia grandiflora is the official state flower of both Mississippi and Louisiana. The flower's abundance in Mississippi is reflected in its state nickname, "Magnolia State". The magnolia is also the official state tree of Mississippi. One of the oldest nicknames for Houston, Texas Is "The Magnolia City" due to the abundance of Magnolias growing along Buffalo Bayou. In 1703 Charles Plumier (1646-1704) described a flowering tree from the island of Martinique in his Genera. He gave the species, known locally as 'Talauma', the genus name Magnolia, after Pierre Magnol. The English botanist William Sherard, who studied botany in Paris under Joseph Pitton de Tournefort, a pupil of Magnol, was most probably the first after Plumier to adopt the genus name Magnolia. He was at least responsible for the taxonomic part of Johann Jacob Dillenius's Hortus Elthamensis and of Mark Catesby's famous Natural history of Carolina. These were the first works after Plumier's Genera that used the name Magnolia, this time for some species of flowering trees from temperate North America. Carolus Linnaeus, who was familiar with Plumier's Genera, adopted the genus name Magnolia in 1735 in his first edition of Systema naturae, without a description but with a reference to Plumier's work. In 1753, he took up Plumier's Magnolia in the first edition of Species plantarum. Since Linnaeus never saw a herbarium specimen (if there has ever been one) of Plumier's Magnolia and had only his description and a rather poor picture at hand, he must have taken it for the same plant which was described by Catesby in his 1730 'Natural History of Carolina, and placed it in the synonymy of Magnolia virginiana variety foetida, the taxon now known as Magnolia grandiflora. The species that Plumier originally named Magnolia was later described as Annona dodecapetala by Lamarck, and has since been named Magnolia plumieri and Talauma plumieri (and still a number of other names) but is now known as Magnolia dodecapetala.